To be honest, I was nervous of the relationship between the two boys. 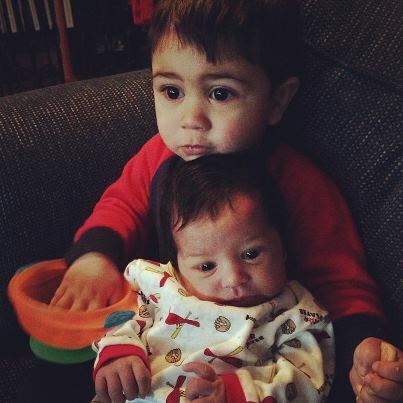 Liam (18 months old) and his new baby brother Levi (2 weeks old). In my family I am the oldest. I love being the oldest. I learned responsibility, patience, how to consider others more than my self, and to protect my younger siblings. I wanted that for Liam and I was nervous that my boys would grow up just being close friends, but Liam not having the same position in Levi’s life as the older brother. And then Levi was born, and I watched Liam instantly get older and almost mature in front of my eyes. All he cared about was his “brodder”. If Levi cries, Liam runs to him to make sure he is ok. Slowly, I began to see traits about my oldest that I hadn’t noticed before. There is a lot more, but that last point had me thinking. 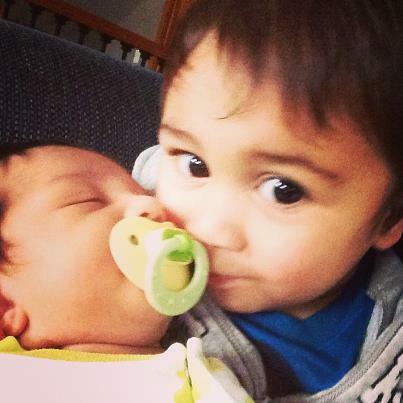 Liam absolutely LOVES to kiss his brother. If he could constantly kiss him and do it all day he would. I started wondering where he got this from. And then it hit me, Britt and I are ALWAYS kissing Liam. It’s what he knows. Its just what our family does (even our extended family on both sides!) It’s whats been modeled to him. And it naturally came to him, that he should kiss his little brother because thats how we show affection and love to each other. I love how affectionate Liam is. And as I see these character traits develop, I am starting to see the type of man my oldest son is going to become. It’s my responsibility to continually nurture, and speak these things into his life! This entry was posted in Uncategorized and tagged Brothers, Kissing, Love, Obsessive by jmuddamalle. Bookmark the permalink.